The June Uprising (Lithuanian: birželio sukilimas) was a brief period in the history of Lithuania between the first Soviet and Nazi occupations in late June 1941. Approximately one year earlier, on June 15, 1940, the Red Army invaded Lithuania and the unpopular Lithuanian Soviet Socialist Republic was soon established. Political repression and terror were used to silence its critics and suppress any resistance. When Nazi Germany attacked the Soviet Union on June 22, 1941, a diverse segment of the Lithuanian population rose up against the Soviet regime, declared renewed independence, and formed the short-lived Provisional Government. 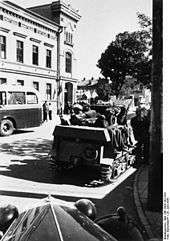 Two of the major Lithuanian cities, Kaunas and Vilnius, fell into the hands of the rebels before the arrival of the Wehrmacht. 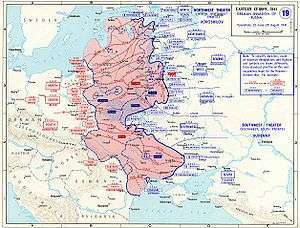 Within a week, the German Army took control of the whole of Lithuania. The Lithuanians greeted the Germans as liberators from the repressive Soviet rule and hoped that the Germans would re-establish their independence or at least allow some degree of autonomy (similar to the Slovak Republic). No such support came from the Nazis, who steadily replaced Lithuanian institutions with their own administration. The Reichskommissariat Ostland was established at the end of July 1941. Deprived of any real power, the Provisional Government self-disbanded on August 5. In 1918, Lithuania achieved independence in the aftermath of the First World War and the Russian revolution. This lasted until August 1940, when the Soviet Union invaded and forcefully transformed it into the Lithuanian SSR and incorporated it into the Soviet Union. The Lithuanian nation was unable to resist the implementation of Sovietization, including nationalization, nor prevent the mass arrests of political activists and others dubbed "enemies of the people". Nor could they prevent the closing of all cultural, religious and political organizations. The economic situation steadily worsened and the standard of living decreased. A year later, just a week before the uprising, some 17,000 Lithuanians, mainly the intelligentsia, were taken with their entire families and deported to Siberia, where many perished due to inhumane living conditions (see the June deportation). It was the single major event that incited popular support for the uprising. That tragedy initially also garnered a positive predisposition toward the German invasion. People who escaped the deportations or arrests spontaneously organized themselves into armed groups, hid in the forests, and waited for a wider uprising. 1 2 3 4 Brandišauskas, Valentinas (2002). "1941 m. sukilimas ir nepriklausomybės viltys". Gimtoji istorija. Nuo 7 iki 12 klasės (in Lithuanian). Vilnius: Elektroninės leidybos namai. ISBN 9986-9216-9-4. Retrieved 2009-07-04. ↑ Литва в период германской оккупации 1941 – 1944 г. (in Russian). runivers.ru. Retrieved 2012-07-18. ↑ Piotrowski, Tadeusz (1998). Poland's Holocaust: Ethnic Strife, Collaboration with Occupying Forces and Genocide in the Second Republic, 1918-1947. McFarland. p. 164. ISBN 9780786403714. 1 2 Jegelevičius, Sigitas (2004-06-11). "1941 m. Lietuvos laikinosios vyriausybės atsiradimo aplinkybės". Voruta (in Lithuanian). 11 (557). ISSN 1392-0677. 1 2 Narutis, Pilypas (June 1971). "1941 birželio sukilimas Kaune". Aidai (in Lithuanian): 255–258. ISSN 0002-208X. 1 2 Dobkevičius, Kazimieras (2006-11-22). "Dzūkija ir dzūkai Lietuvos istorijos verpetuose". XXI amžius (in Lithuanian). 87 (1487). 1 2 J. G. (June 1975). "1941 m. sukilimo istorija". Aidai: 287. ISSN 0002-208X. ↑ Zemlickas, Gediminas (2000-03-09). "Apie Birželio sukilimą ir Lietuvos laikinąją vyriausybę". Mokslo Lietuva (in Lithuanian). 5 (207). ISSN 1392-7191. ↑ Knezys, Stasys (2000). "Kauno karo komendantūros Tautinio darbo batalionas 1941 m.". Genocidas ir rezistencija (in Lithuanian). 7 (1). ISSN 1392-3463. ↑ Greenbaum, Masha (1995). The Jews of Lithuania: A History of a Remarkable Community 1316–1945 (9th ed.). Israel: Gefen Books. p. 307. ISBN 965-229-132-3.